Appears to be real mink there on the mayors coat. 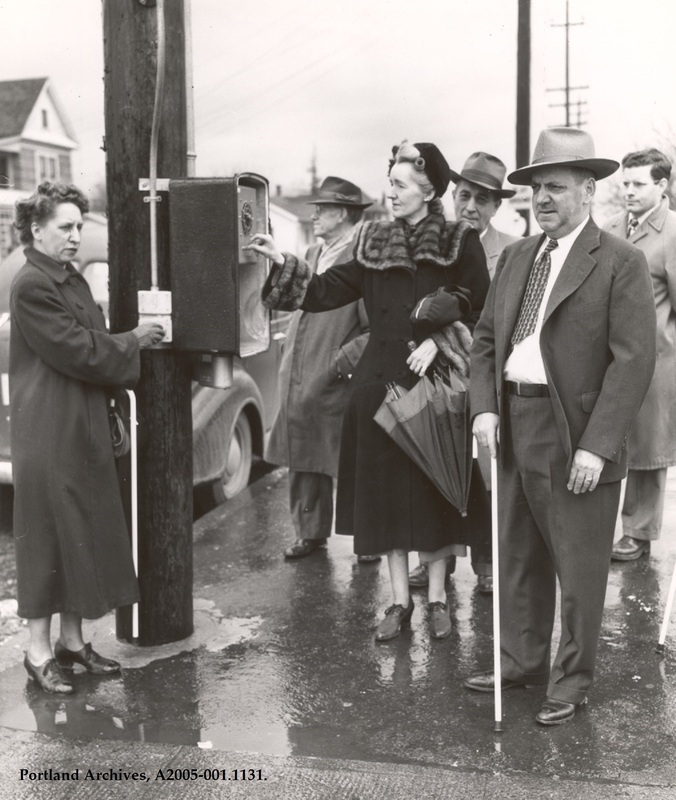 Fred Fowler received an honorary cane and a ceramic burrow from the School of the Blind as a token of gratitude for his installation of a special traffic signal for blind and deaf people at the intersection. Until 1952, the School of the Blind was located on NE 84th and Glisan. Prior to the special traffic signal, the intersection of 82nd and Glisan was known to the blind as “Death Valley”. SE Corner of that intersection? No single family homes near this corner now. That probably is real mink. Not seen too much today. Every picture I have ever seen of Mayor Lee presents a woman who is distinguished and ultra refined. Classy would be another adjective but that would be a wee bit redundant. Various entry’s in Kimbark MacColl’s volumes tell of DML and what a vanguard leader she was …Portland’s “iron lady”. Some intersections in SE still have those old pedestrian devices. Gotta love a good mink coat! GOOD OLD DAYS WHAT CLASS ! Edge Lord, wouldn’t you agree that a “ceramic Burrow” is the perfect gift to express the students appreciation? The Portland School for the Blind moved from this location but their original building still stands and is being used by Multnomah Bible College err Multnomah University, cough.